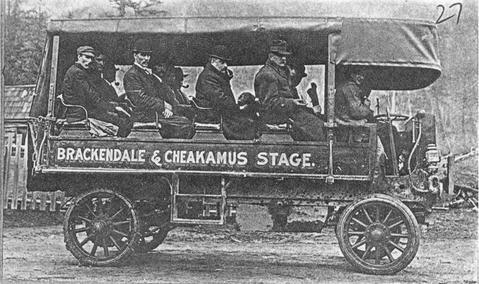 Brackendale & Cheakamus stage in 1910 (or 1908? ), driven by Henry Judd. Judd started with oxen in 1903 and later changed to horses. This pictured incarnation of the stage was known as the "Rapid". In 1912, it was supplemented by a new Garford motor truck. Harry Judd provided transportation services between Squamish Dock and the Cheakamus Lodge at Cheekye -the beginning of the Pemberton Trail. Additional information provided by Eric Andersen, 2012 for Garibaldi dsiplay in library.